My poem “Letter to My Son Concerning Our First Night of Birthing Class” is included in Linebreak’s fascinating new project, Two Weeks: A Digital Anthology of Contemporary Poetry. You can buy the book (and listen to a reading of my poem!) via the link above. 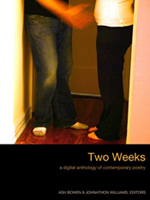 Two Weeks is a new anthology of contemporary poetry, released exclusively in ebook format. The book was compiled, edited, designed, coded, and published in exactly 14 days. Our purpose was to test how quickly a book of poetry could be crafted given new technologies, and to prove that neither speed nor technical limitations need diminish editorial standards or strip essential formatting. We hope you enjoy the result.